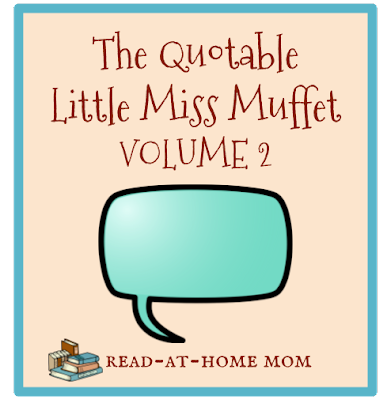 As we head into this holiday weekend, I thought it was a good time to share some more quotable quotes from Little Miss Muffet, who is about to be three-and-a-half. "Beethoven? I've never heard of him. I've only heard of Mozart." My husband has always played classical music on the stereo for both girls, especially in the afternoons when they are restless. I'm sure Miss Muffet has heard Beethoven before, but Mozart apparently made the greater impression. Either way, her saying this made me think of Schroeder from Peanuts. "That shoe looks like a baby's face." She said this out of the blue when we were getting to ready to go out one day. When asked why, she said, "Because it's smooshed a little." At least she's prepared for a smooshy-looking newborn. "Do you ever work, Mama?" When I explained to her that my work involves doing all of her homeschooling and making her lunch and finding her playdates and reading to her, she seemed genuinely surprised. And then she wanted to know if the dining room table is my office. Me: "Astronauts are people who know how to explore space." Miss Muffet: "And librarians know how to discover books." On our April road trip to NY, Miss Muffet spent a long stretch singing to her stuffed monkey. At one point, we heard her sing, "And everyone diiiies," followed a little later by "whooo will take care of youuuu when your parents gooo awaaaaay" and "when you parents go awaaaaaay it's an opportuuuunity to take care of yourseeelf!" I really have no idea where she gets these things. On Groundhog Day, we were out for a walk looking for shadows. She noticed her reflection in a store window, so I asked her, "What is a reflection?" Without hesitation, she said, "It’s when you see somebody, and it’s you!" I can't think of a better definition. In character as the Virgin Mary during a make-believe game with her sister: "Don't bother me, Jesus. I'm in the middle of something." As always, 7 Quick Takes is hosted by This Ain't the Lyceum. The most favorite things my kids have said over the years were inevitably from when they were 3 years old! I LOVE the last one! Kids still say the darnedest things!